Measuring device for determining the mold strength directly at the sand mold. As molding machines achieve different degrees of compaction (see Compaction), the sand strengths in specimens measured during general mold sand testing (produced using a rammer and 3 rams) cannot be directly compared to each other. Therefore, mold strengths obtained from comparative measurements are required in order to verify the compaction effect of molding machines or the susceptibility to compaction of mold sands. Today, strength testers (Fig. 1) are available which provide much more precise measurements than the mold hardness testers (see Mold hardness) that used to be typical. 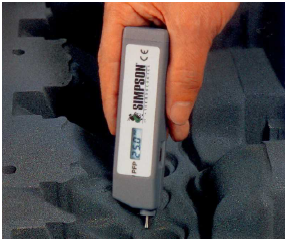 Such electronic strength testers use an oscillating quartz sensor to perform a practically pathless force measurement. The force measured corresponds to the penetration resistance as a measure of mold strength. Fig. 2 compares units of mold hardness measurements to strength values measured by means of the device described above.